Tandem skydiving is where you are strapped to a professional instructor in which you are along for the ride. The two of you free fall from over 2 miles up and you experience one minute of free fall and about five minutes under a parachute. 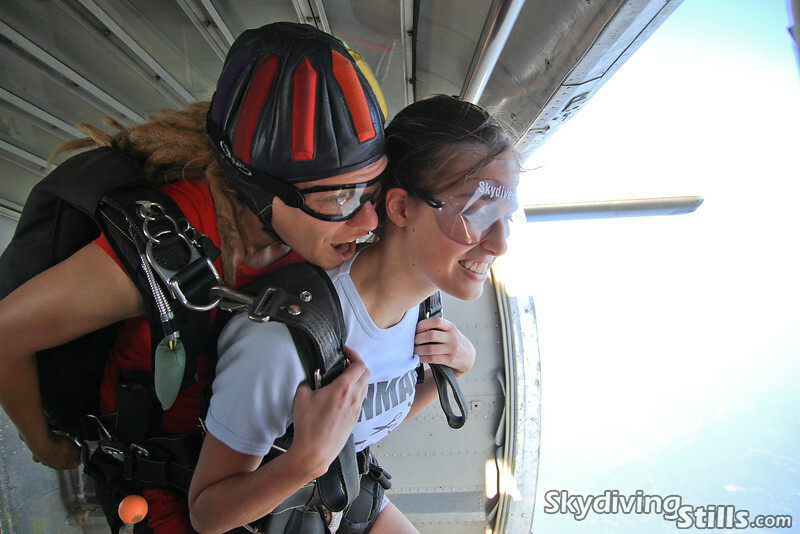 Tandem skydiving is where you can "get your feet wet" and see what skydiving is all about. From under the parachute, you can even see the UConn campus and the dome of Gampel! Has skydiving been on your bucket list for quite some time? This is your best opportunity to go skydiving. You can convince all of your friends to go with you and even get a video! Tandem skydiving is the safest method of making your first jump. You are strapped to a professional instructor who often has thousands of jumps. But what if the parachute doesn't open? It is very rare that a parachute experiences a malfunction, but in the event that it does happen, there is a secondary, reserve parachute that is also part of the parachute rig. You need to be at least 18 years old and that's basically it! When you get to the drop zone, you will be given a brief training of what to expect during the skydive. For more information click here. We hold a tandem weekend for UConn students once a semester. During this weekend we offer a deeply discounted skydive for UConn students. We offer carpools from campus if you need a ride. Plan on being at the drop zone for most of the day and dress for the weather. We will post more information regarding dates and pricing when the event gets closer. Don't want to wait until we hold our tandem weekend? You can also go any time our home drop zone is open, but you will not receive the UConn discount. Can I bring my own GoPro? ​--USPA regulations and our airport require a jumper to have a minimum of 200 jumps to jump with a camera. So unfortunately, you cannot bring your own camera. How long will it take me to jump? ​--The training class on the ground takes about 15- 20 minutes. The plane ride up to altitude is about 15 minutes. You will be in freefall for about 1 minute (that's a long time! Try holding your breath for that long! ), and you will be under the parachute for about 5 minutes. ​--That depends. In the summer time, it can be quite refreshing at altitude. In the spring and fall, sometimes it can be chilly. As a general rule of thumb, the temperature drops by about 3 degrees for every thousand feet up and we jump from about 13,500 ft.
​--To some people, yes. But life is all about stepping out of your comfort zone!